A Pioneer in Long Distance Aviation. The flight from the UK for the 24 passengers had taken several days, chugging along at a leisurely speed of 100 mph. There had been frequent stops, including overnight stop-overs. 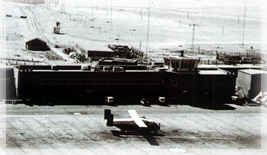 Nonetheless, the first scheduled air services had been established to what was the Gulf's first international airport. But the first actual recorded flight to Bahrain took place as far as 1918 and the very birth of long-distance pioneer aviation. A Vickers Vimy bomber of the Royal Air Force landed on a survey flight from London to Calcutta. It was trying to establish if long-haul flights were possible through hot countries. The flight proved to be just about bearable, although it took 27 days to accomplish. It was, however, to see the start of a regular air mail service on the route. Operated by the RAF, there were few navigational aids available in those days and flights across the desert sections often followed the sand furrows for want of more formal navigational guidance. Imperial Airways, the forerunner of what was to become BOAC and then British Airways (BA), operated several proving flights through the Gulf in the late twenties, before starting scheduled services. According to records, the first Imperial Airways flight to Bahrain was in August 1927 when a local pearl merchant chartered a De Haviland aircraft from Baghdad to Britain. Even for this relatively short sector an overnight stop in Basrah was required. The De Haviland bi-plane, was to become the standard long-haul aircraft for Imperial Airways and was used on the route between the UK and India after the airline began scheduled services via Basrah, Bahrain and Sharjah, with Kuwait added soon after as an optional calling point, By 1936 the operation had been stepped up to a twice-weekly frequency. In 1937 the limelight in commercial aviation was stolen by the flying-boats and Bahrain was to see the start of regular service by the famous Short’s Empire sea-planes. The “landing strip” for these lumbering giants was a stretch of water between where today the Marina Club is located and Mina Sulman. A passenger terminal, known as “Bahrein Marine Airport”, (the spelling of Bahrain had yet to be standardised ) was located nearby on dry land from where passengers were ferried to the aircraft. Flying-boat services to Bahrain continued into the early 1950s. At their height, what by then had become, BOAC was operating several services a week through Bahrain. These included weekly services to Karachi, Singapore, Hong Kong and three times a week to Sydney. By 1950 BOAC was already looking to return to more traditional forms of air transport, which offered a greater passenger pay-load, This saw the return of commercial passenger flights to Muharraq. using Argonauts, a fourengined aircraft which could carry up to 60 passengers. Services were steadily built-up to the point where there were three Argonaut services a week from Europe terminating in Bahrain. But 1950 was a significant year not only for Muharraq as an international airport, but also for Bahrain’s own commercial aviation history. This was the year in which a new local airline, Gulf Aviation Company, was formed - the forerunner of Gulf Air. The airline was created with just one aircraft, a second-hand Anson Mark ll., which was used initially on services to Dhahran. But within two years the fleet had expanded to four De Haviland aircraft and four DC-3s for use on a steadily growing network in the Gulf. By this time Bahrain was firmly established as an international staging post. It was easily the most modern and advanced airport in the Gulf with a good runway, control tower, lighting, communication facilities and even a restaurants. It began to attract other carries such as Middle East Airlines, Air India, Air Ceylon and Iran Airways - all mostly operating Dakotas. In 1954 Bahrain’s position as the major airport in the region was further enhanced with the establishment of a new Flight Information Region based in Bahrain to cover the navigation of aircraft in transit through Gulf airspace. This saw the installation of modern navigational and communications equipment. Soon after this Bahrain was to enter the jet age with the arrival, first of the Comet and then the Boeing 707. These aircraft reduced the number of stops the airlines had to make on long-haul routes. With many intermediary stops withdrawn, the advent of the jet age again focused attention on Bahrain as a major stop-over point between Europe and the far East. To cater for this growing transit traffic a new passenger terminal was opened at the airport in December 1961. But the decade was to witness an explosion in aviation growth, brought about largely by the advent of the Boeing 747 jumbo jet which could carry 400 passengers. It became obvious that if Bahrain was to retain its position as a leading regional airport and transit hub it would have to expand yet again. In December 1971 new passenger facilities were opened with an apron area which could accommodate four B747 aircraft. Together with other capital costs the whole project amounted to BD4 million at a time when the annual revenue of the whole of the State of Bahrain was BD13 million. But it was an investment which was to quickly pay dividends. Qantas, BA, Air India and Singapore Airlines all began to use Bahrain International Airport as a major transit stop with their B747 aircraft. Unfortunately for Bahrain, all the carries wanted to make their transit stops at around about the same time. Even with the new expanded airport facilities it quickly became obvious that further expansion would be needed to accommodate these “jumbo peaks.” A further expansion phase of the airport was completed in 1976, just five years after the opening of the new passenger terminal. The year 1976 also marked another significant first for Bahrain International Airport with the inauguration of supersonic flights which saw the start up of regular BA Concorde service between London and Bahrain. By this time what was now Gulf Air, had been progressively expanding its network of services and in 1976 took delivery of its first Lockheed TriStar aircraft. It was to herald Gulf Air’s transformation from a local regional airline with all the significance that implied for its home hub of Bahrain International Airport. Further expansion of the airport’s facilities took place in the early eighties as a prelude to the major expansion and refurbishment programme that is set for completion in March 1994. Historical introduction about Bahrain Airport Services. Facts and history about The Engineering Services Department. Oldest press about BAI. New centre to help business travellers. Historical Landmarks of The Bahrain Aviation Fuelling Company.